Henry Moore and Barbara Hepworth have significantly grown as inspiration and influence on my own artwork and glass sculpture. In the first article, Inspiration in Art, I explained the complexity about inspiration. In the second article, Influence Behind My Glass Sculpture, I described the relationship between “inspiration” and “influence”. As I was becoming increasingly more interested in moving away from purely decorative vases and vessels, I was doing more drawing and sketches of forms that were less functional. My wife, Katie, said to me that my sketches reminded her of the sculptures by Henry Moore and Barbara Hepworth. I had not made that connection until Katie pointed it out. Both being artists, we have numerous books on art and artists. 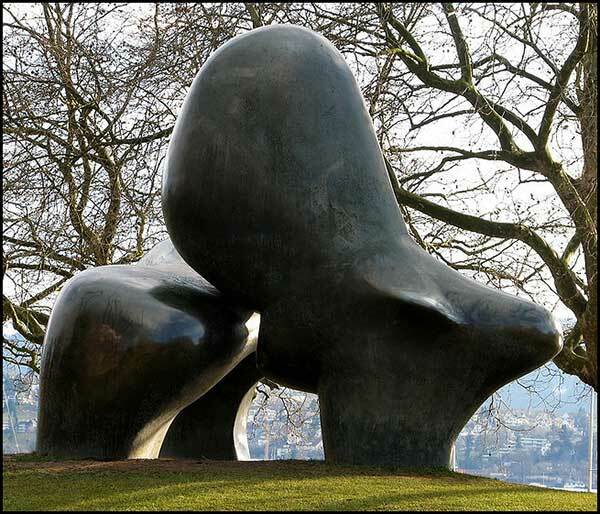 Not that I wasn’t familiar with the work of Henry Moore, but revisiting his work immediately had an impact on what I was trying to do. 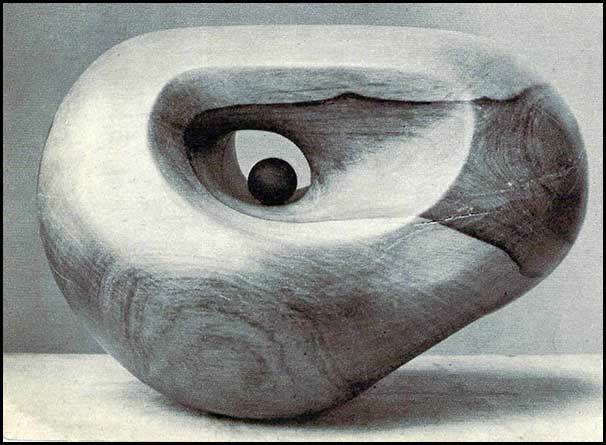 This piece by Henry Moore in 1935, called “Carving”, in particular became of great interest to me. Part of what interest me was the simple form and the added dimension created by the pierced hole. In 2003, I put together a series of sketches that were based on this work. In first couple of sketches, I tried to emulate the form to feel out the direction I wanted to explore further. 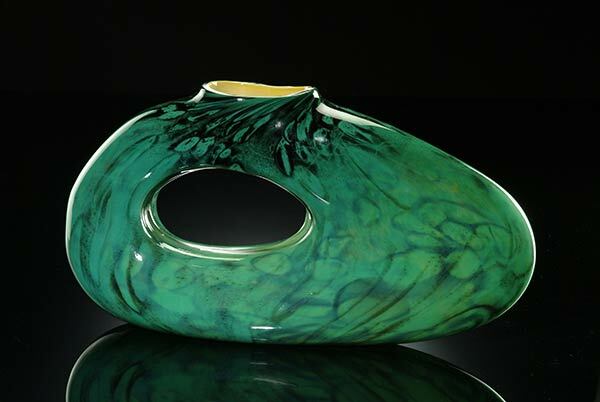 My intent was not to copy Henry Moore’ s work and make it in glass. I viewed it as a starting point while I was trying to wrap my head around the reasons for moving in this direction. 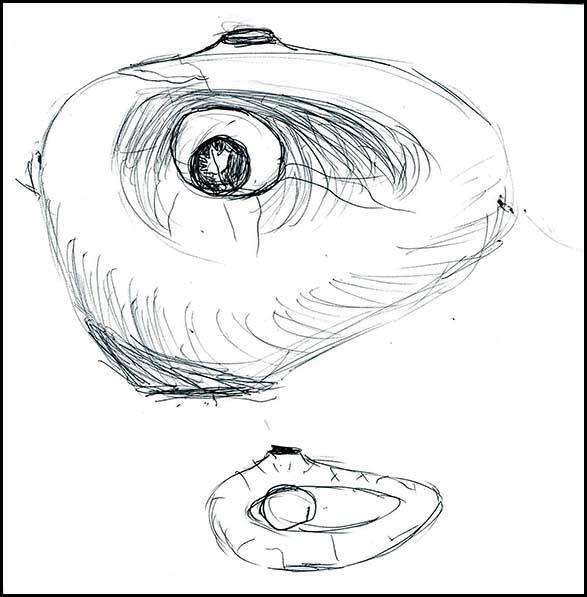 By 2004, I had begun making glass sculptures based on this sketch, such as the Jade-green Bolinas shown here. Also at this time, I began to explore color techniques that would later permeate throughout the next body of work. In 2006, I began to incorporate elements from past work. The Trans Bolinas evolved into the current form. Shown here in the amber and yellow color palette. 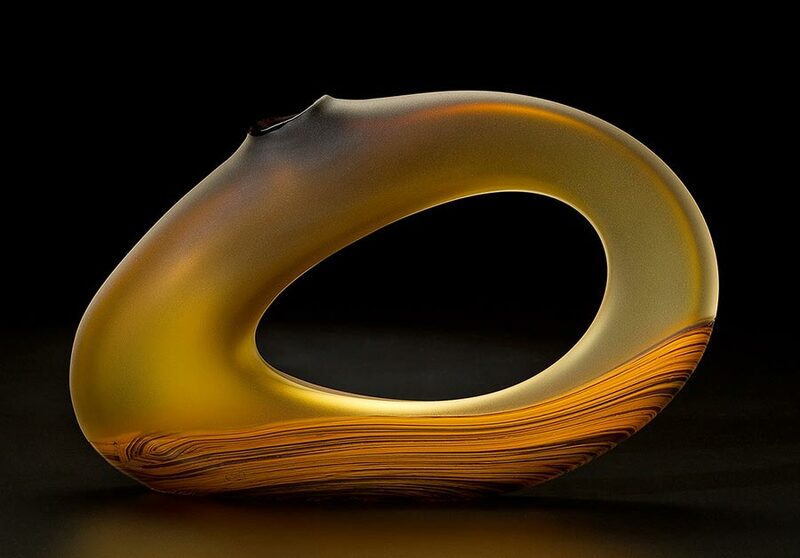 The translucent quality created by the sand blasted surface added a dimension to the form. These and other qualities worked their way into the Melange Series of sculpture. Henry Moore and Barbara Hepworth continue to have an impact on my work, however it is important to me that through their influence, my own voice emerges. Inspiration and influence can be complex… but most of all, they simply lead you down a path coupled with your own personal experiences.